We’re up early for a sunrise shoot at the Everest view point a kilometre away from the lodge we stay at in Namche Bazaar. It’s cold outside. I’m not feeling too well. I didn’t drink a drop of liquor the night before and yet I have the symptoms of a hangover. It seems the first night sleeping at 11300ft ASL. had an adverse effect on me. I find it odd as I have slept before on the Drakensberg at 10500ft without any discomfort. The previous afternoon we had spent our time shopping and exploring Namche Bazaar. 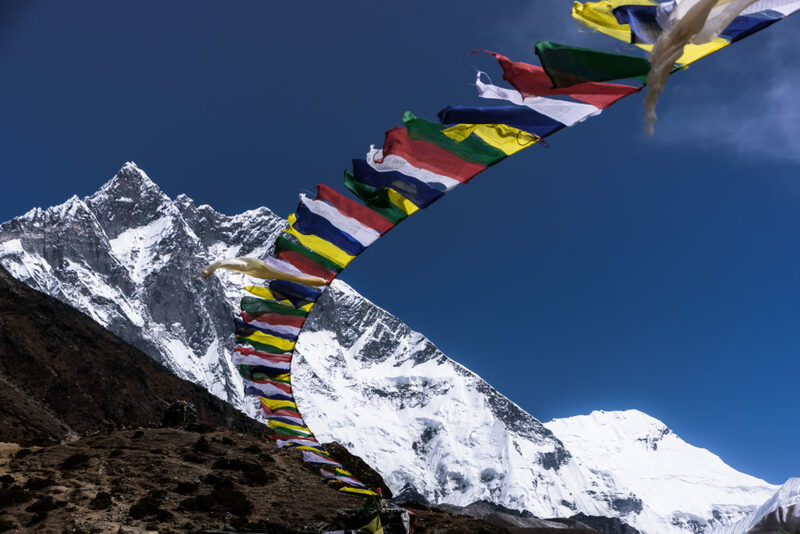 Namche is the main trading centre and hub for the Khumbu region. 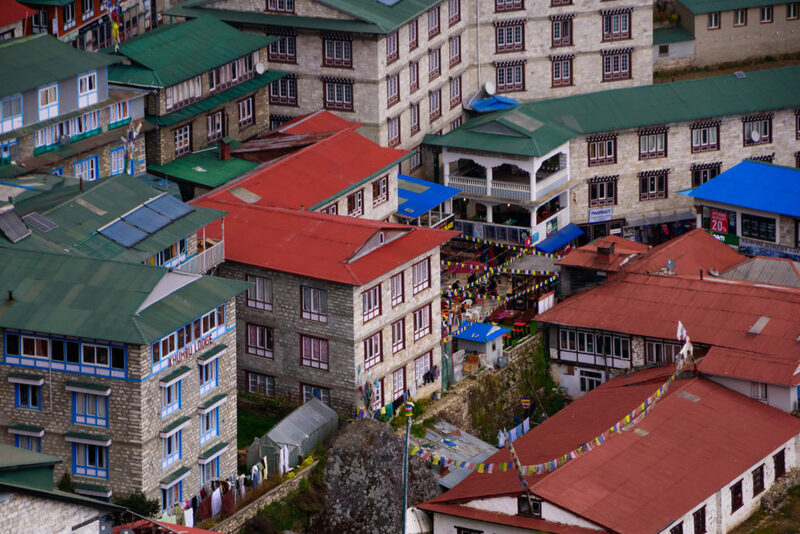 The town is popular with trekkers, especially for altitude acclimatization, and is the gateway to the high Himalaya. It has a number of lodgings and stores catering to the needs of visitors as well as a number of internet cafés and coffee shops. You can still buy all sorts of hiking gear here but at a premium. Our tour leader Wayne knows his way around town and leads us to the cosy Café de 8848 and Illy Espresso Bar in the centre of town. We savour our cappuccinos and treat ourselves with a delightful tiramisu. Afterwards I climb to the helicopter viewpoint to get an aerial view of Namche. I’m surprised at the effort required to climb the little hill. Climbing up the stairs leaves me completely out of breath. The view down to town is totally worth it though. 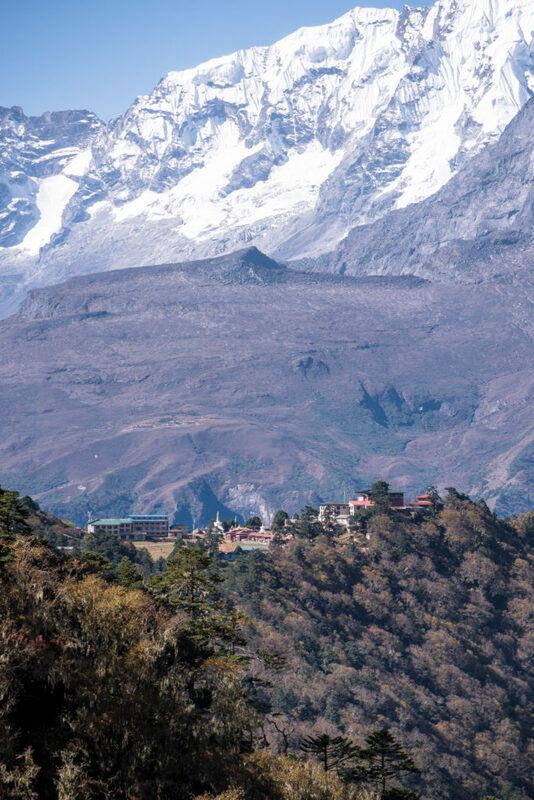 I can’t think of another town that has a more spectacular location and view than Namche. Mist that moved in during the afternoon unfortunately prevents me from seeing Kongde Ri (6187m) to the west and Thamserku (6623m) to the east. As we make our way up the steps the next morning to the Everest view point the previous day’s exertion and altitude gain immediately turn my legs to jelly and my lungs to that of a heaving dog. It’s only a kilometre away from our lodge but takes almost twenty minutes to reach. We’re out of luck as the mist has not cleared. We are supposed to have a breath taking 270 degree view of the surrounding mountains but instead we look at dull clouds. I nevertheless manage to capture a decent image of the valley down below from where we came the previous day. Back at the lodge after breakfast we stow away unnecessary items to save weight. We’ll make our way past Namche Bazaar on the return journey. It’s rush hour as we leave the lodge just past eight o’clock. It seems everyone had the same idea for a departure time. As the sun finally burns the mist away we can see Thamserku in all her glory towering 10000ft above us. Coming round a corner in the path after twenty minutes of hiking from Namche, a view greets us that leaves everybody in awe. 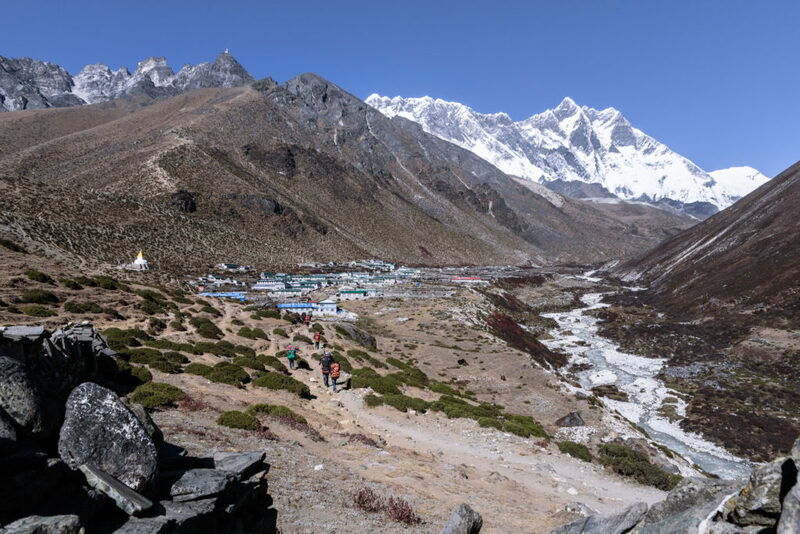 Up the valley to the north, far in the distance is Everest and Lhotse, a bit more right is Ama Dablam; a mountain that basically dominates the whole Everest Base Came Trek, and to the right Thamserku. 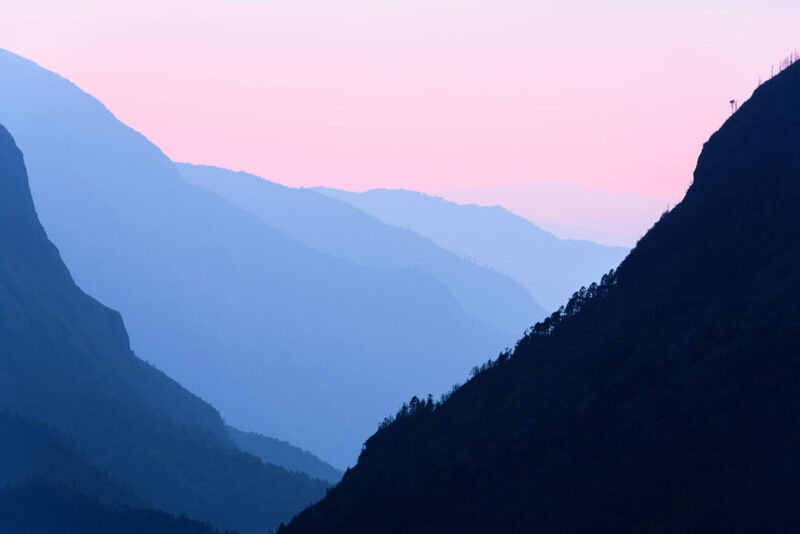 Crepuscular rays cut into the valley, framing the ridges of Thamserku’s lower slopes. It’s beyond belief how deep and steep this valley is. 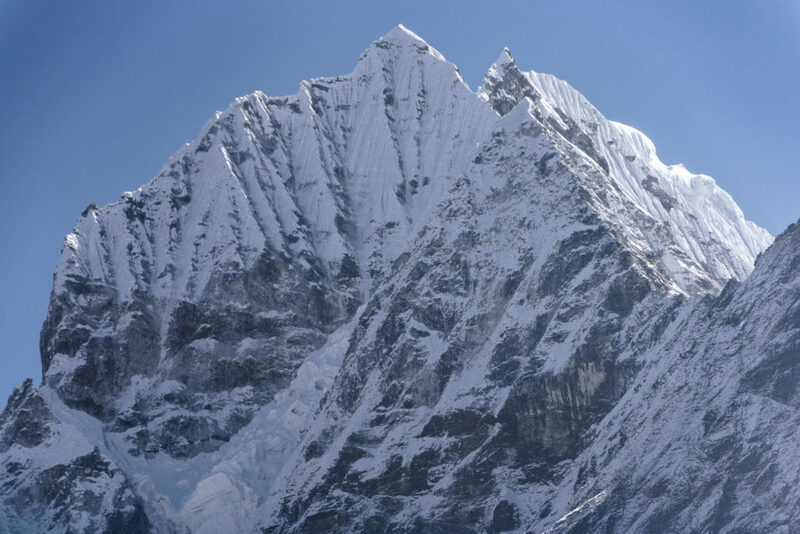 Snow and ice are chiselled by the wind into sharp ridges on the upper slopes of Thamserku. 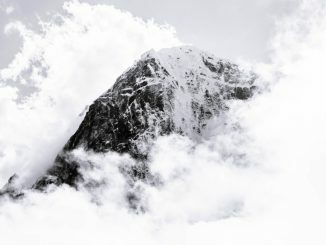 How on earth does snow cling to these vertical cliffs? Still more than 20km away. 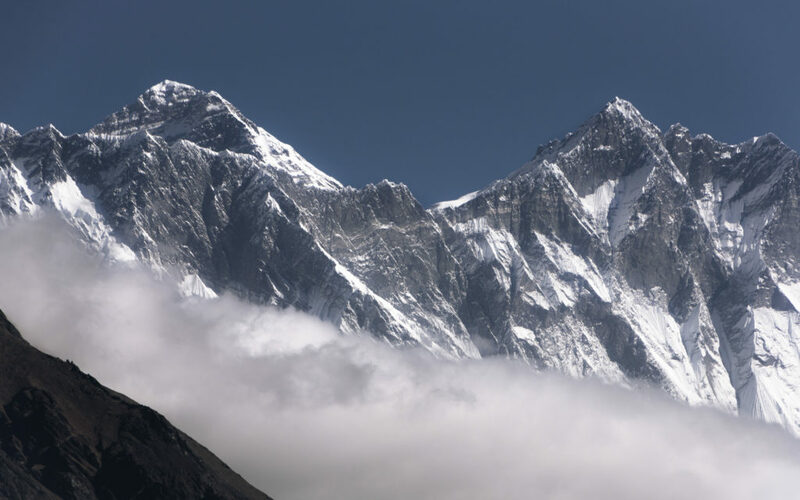 Nuptse, Everest and Lhotse. I spend a while here, taking photos, taking it all in. I have to pinch myself. For the first time on this trip I can feel and see that I’m finally in the Himalayas. From here the path follows the contour with very little altitude gain or loss. It’s paved. The early morning’s hiker bottleneck soon disappears as we hang back a bit. 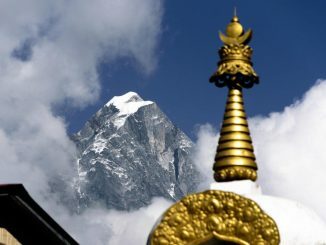 We get beautiful photo opportunities of stupas that line the route with Ama Dablam in the background. Two hours later we reach the Everest View Hotel for tea and snacks. There’s not a breath of wind and the white peaks pierce the cloudless sky. 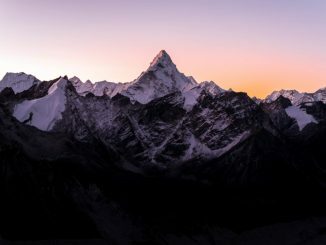 We have a panoramic view of Taboche (6367m), Everest, Lhotse, Ama Dablam and Thamserku. While sipping my orange tea I can’t peel my eyes from these mountains. A nasty little section lies ahead. 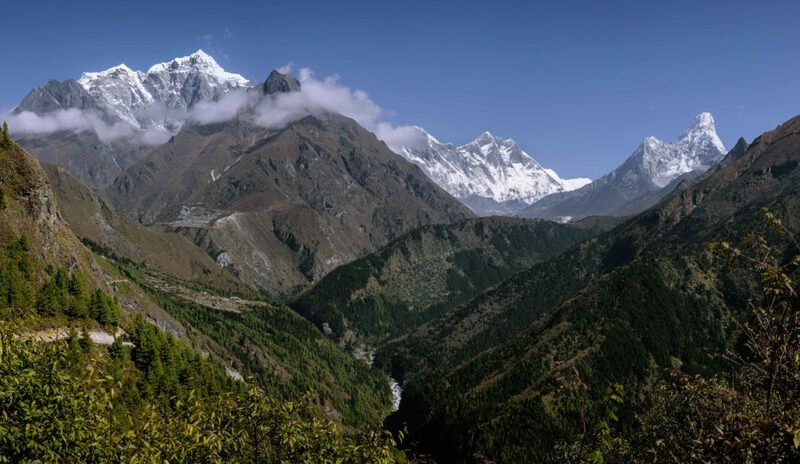 We need to lose 400 meters to the valley floor far down below before climbing those 400 meters back up to Tengboche. During the downhill section I pass lots of trekkers going uphill. It seems like hard work. Grimly I realise that I’ll also have to climb here on the way back. A little bit tired and hungry I decide to go down as fast as possible, leaving the group behind me. Porter carrying plastic bottles. A very awkward load as it snags on tree branches. At the bottom off the pass is the village of Phunke Tenga which has water driven prayer wheels. Asmit, our guide, has gone ahead of us there earlier. Without trouble, I spot him at the café where he is waiting for us to have lunch. “Lekker lekker!” he welcomes me. I smile. The Nepalese are the friendliest people I’ve ever come across. A young boy tending his family’s shop. It seems Nepalese kids do chores from the moment they can walk. Adequate hydration is essential at higher altitudes. Drinks included in our package for breakfast, lunch and dinner are lemon tea, ginger and honey tea, three teas, orange tea, black tea, masala tea and hot chocolate. Luckily I love tea and it therefore helps me a lot with hydration. Per day I have at least seven cups of tea. Thus with tea alone I drink each day about 1.4 liters of liquid. I also drink a 1 litre bottle of water before departure each morning, carry 1.5 liters of water during the day and then drink another litre when I arrive at the next lodge. This brings my water intake per day to about five liters without batting an eye. 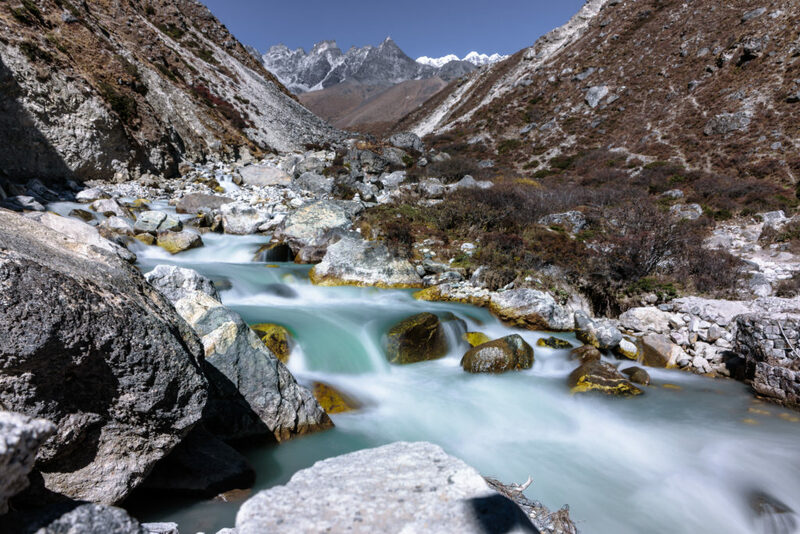 The recommended water intake for high altitude trekkers is three to five liters per day. The menus on the trek cater for a wide variety of diets. You can order at most places anything from fries, pizza, dhal bat (rice with lentils), Himalayan bread and various soups to vegetarian hamburgers. It’s recommended to stay away from meat. After lunch we go through another checkpoint and then the climb to Tengboche starts. It’s an arduous two-hour long climb only made better by Kangtega (6685m) keeping a watchful eye on our snail’s pace progress. The pass tops out at 3860m / 12660ft. 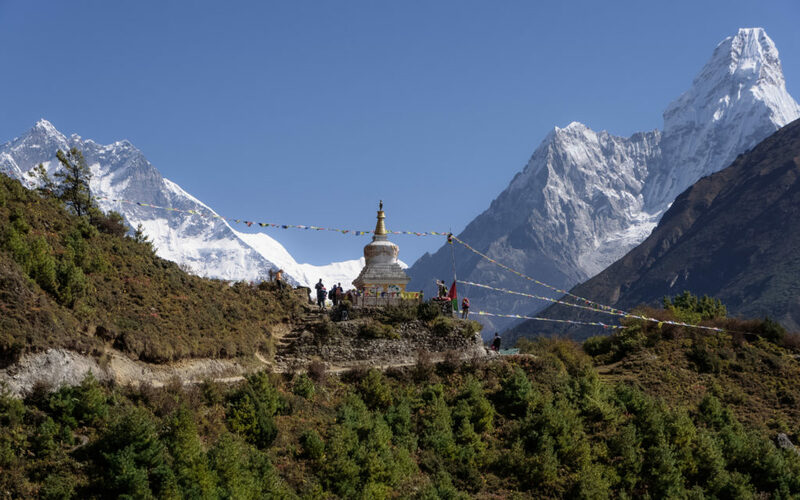 A much closer view of Everest and Lhotse greet us from the Tengboche Monastery. 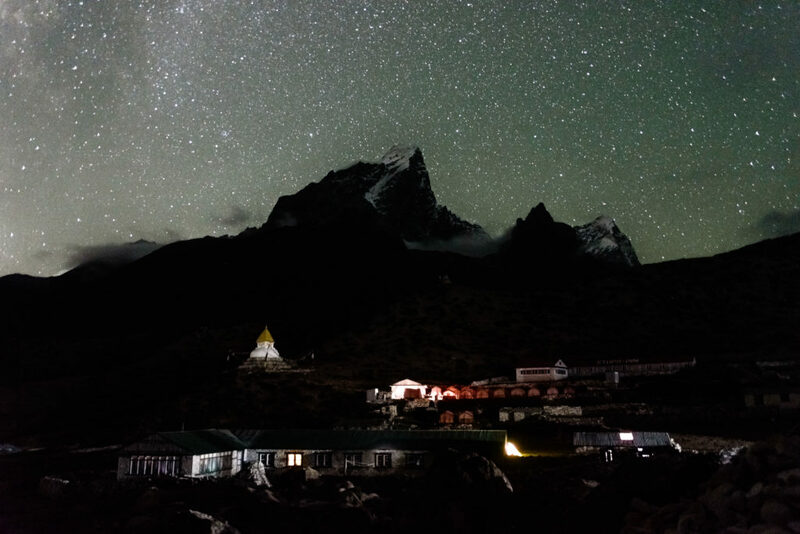 The monastery is the largest gompa in the Khumbu region of Nepal. In 1934 it was destroyed by an earthquake and was subsequently rebuilt. In 1989 it was destroyed for a second time by a fire and then rebuilt with the help of volunteers and international assistance. 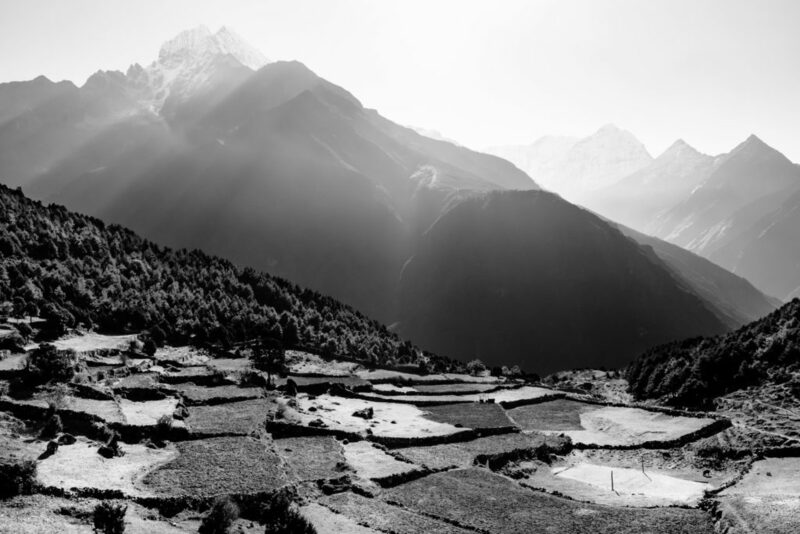 With daylight fading fast we make our way down the path to Deboche (3820m), a half hour’s hike away. We check into the Paradise Lodge. The tea room is steaming hot and we have a lovely dinner after a long day’s hike. 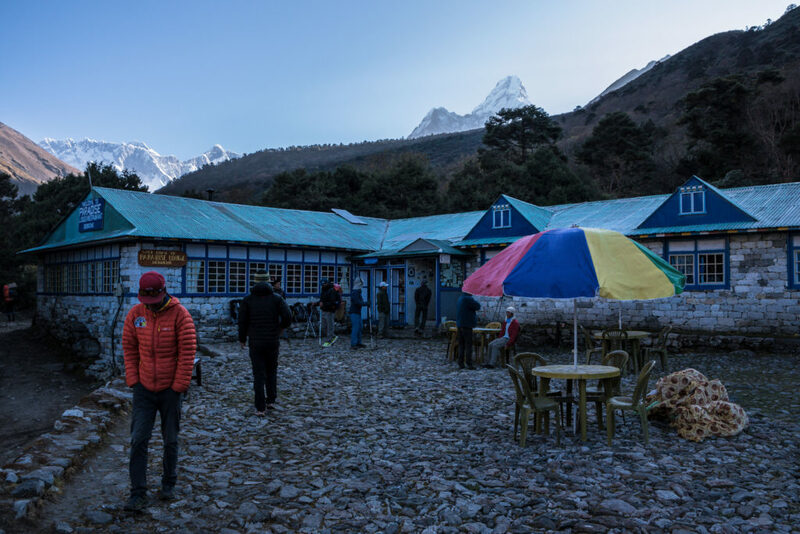 The rooms are the coldest, noisiest and least comfortable thus far encountered on the trek. It’s too cold to even bother with a cold shower, so wet wipes have to suffice. It’s also here where I first make my acquaintance with the “wet” toilet. Going to the toilet is by far the grimmest task in this part of the world. 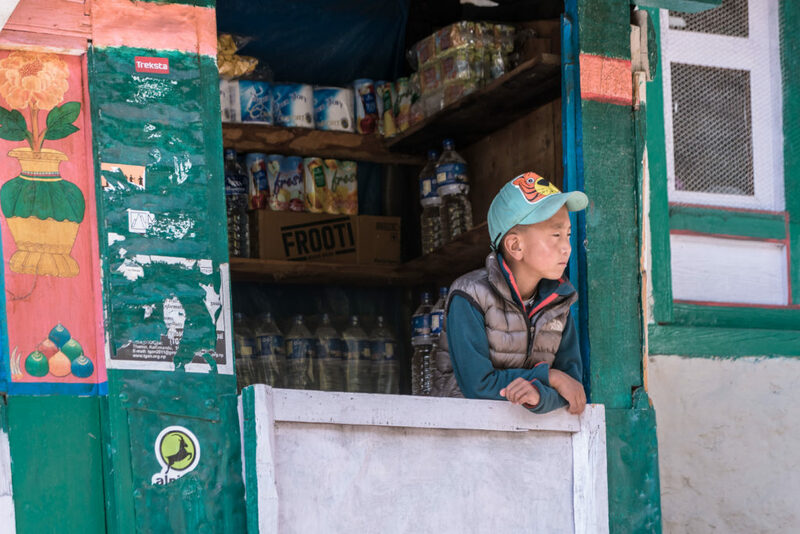 Up until Dingboche we would still find western toilets but they don’t flush with a handle…you need to scoop water (in most cases with a rusted can) from a larger water container and flush it down the toilet. This system always leaves the toilet stall wet with water sprayed everywhere. Toilet paper can also not be flushed down these toilets and has to be thrown in an open bin next to the toilet in the stall. The ultimate ordeal was Gorak Shep (5100m) that also used this system but with a squat toilet. Deboche was the first evening where I started to struggle with sleep. As I fell asleep my breathing would become shallow, causing me to suddenly gasp for air just as I was entering dream land. Later in the trip I would fall asleep without trouble but in the mornings after 3am I would wake up and this process would continue ad nauseum until the sun rose and I finally could get up and out of bed. As the first sunrays hit the frosted corrugated roof of the lodge, water cascades over the roof’s edge. 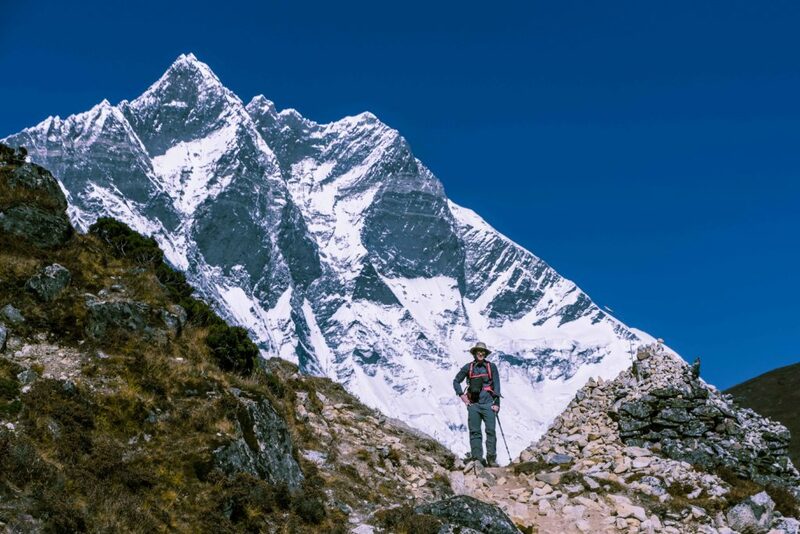 Today is an eight-hour trek to Dingboche (4412m) with a 700 vertical metre altitude gain. On the eastern side of the river we walk in the crisp shade through an ethereal forest of copper beech, juniper and pine. Moss strands give the Rhododendron forest a spooky feel. 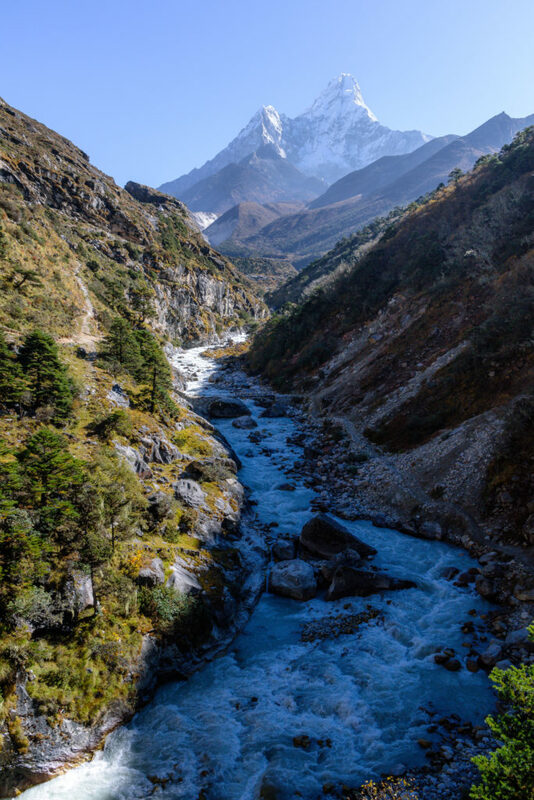 At the end of the forest we cross over to the western side of the Dudh Koshi with Ama Dablam giving a dramatic backdrop for the newly built suspension bridge. 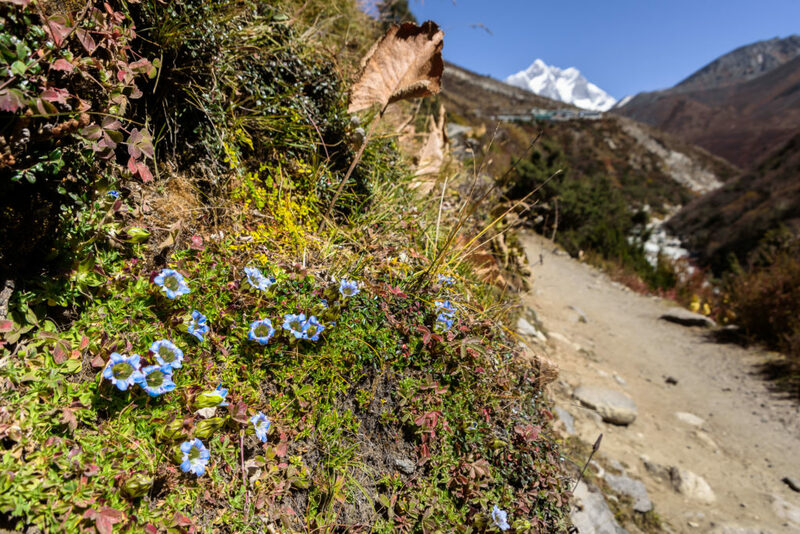 Now the trail gently climbs toward Pangboche where we have lunch. 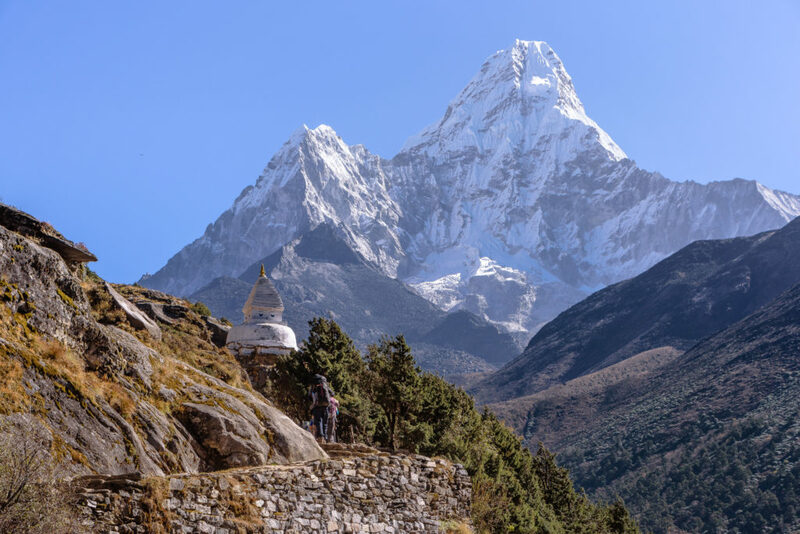 Ama Dablam across the gorge dominates the sky line and we can see climbers near the 6856m high summit. After Pangboche we finally move out of the tree line at 4000 meters. Our pace slows down due to us breathing heavily and the constant stops to take photos. I make use of the slower pace to film a video for friends and family back home. The wind is picking up but the sky is still cloudless. Soon after this we again cross the Dudh Koshi at its confluence with the Imja River coming from the Island Peak valley. 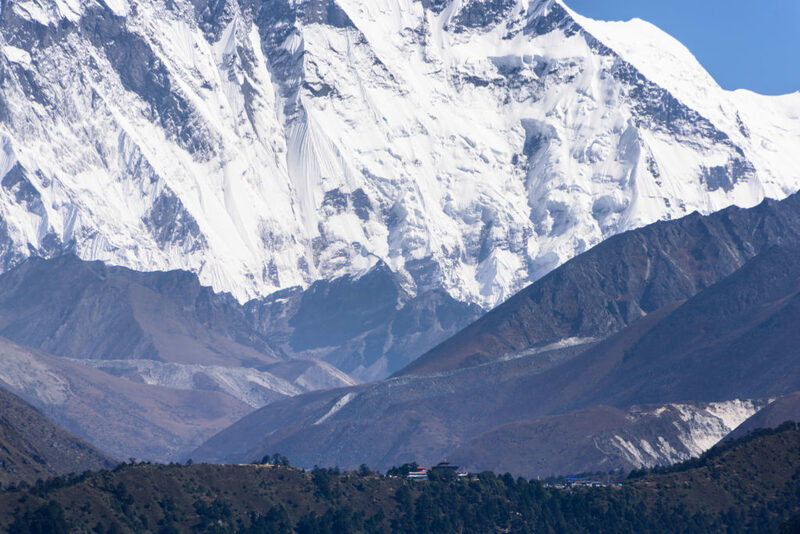 It isn’t far now to Dingboche. 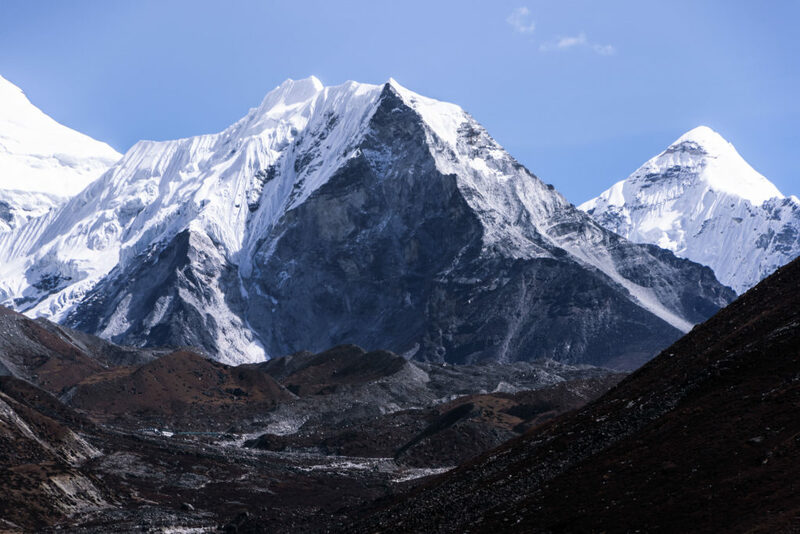 Massive glacial moraines slither from Ama Dablam’s slopes like lava flows. The colour of the sky is a deeper blue than I’ve ever seen before. At last after a whole day of trekking we get to Dingboche. 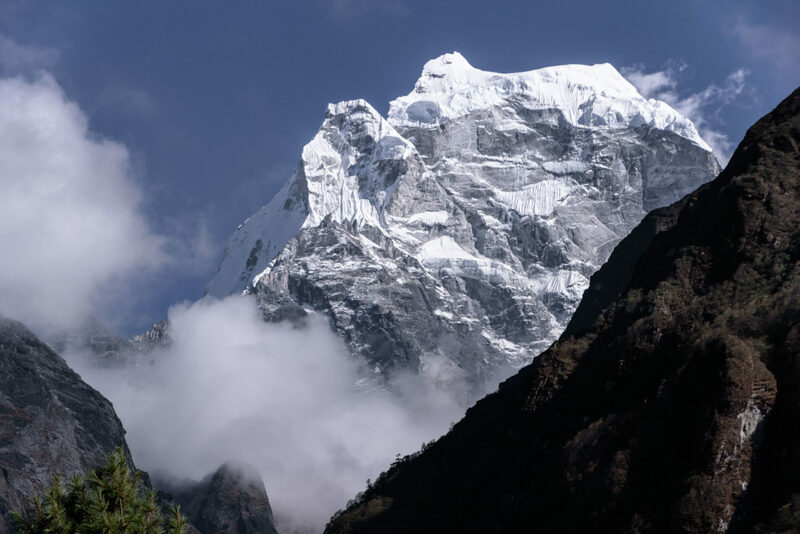 It’s situated on the valley floor next to the Imja River coming from Island Peak, surrounded by Ama Dablam, Taboche and Lhotse to the north. We check into the Moonlight Lodge, by far the best lodge on the whole trip. Excellent hospitality from the owner, Ram, en suite western toilets, albeit with the ”wet” system and lovely spacious south facing rooms. 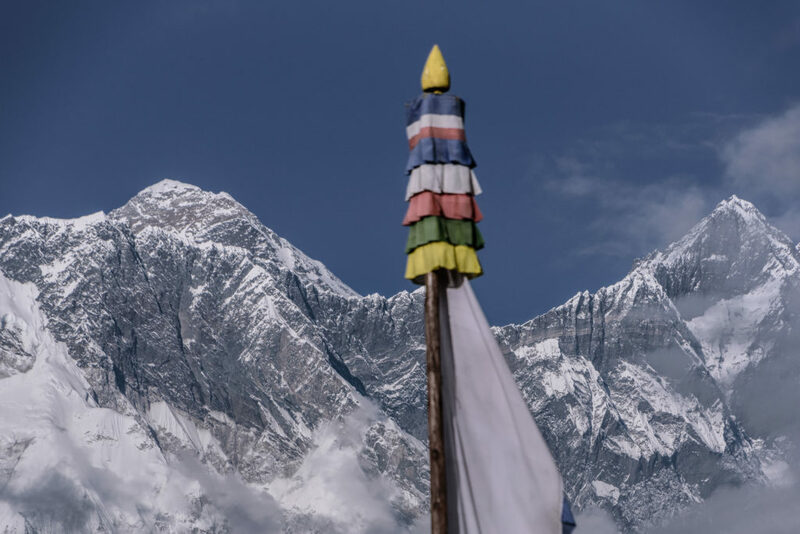 Dingboche. On the left the path leading up the “koppie” to the 5100m high viewpoint. In the afternoon I do some washing in freezing cold water. I can live with dirty shirts and pants, but to stick my feet into wet, damp, smelly socks in the morning is just too much to bear. After a warm and filling dinner, we brave the cold outside to make use of a cloudless sky for night photography. The northern hemisphere’s night sky looks completely different and it’s weird to not see the Southern Cross in its usual place. 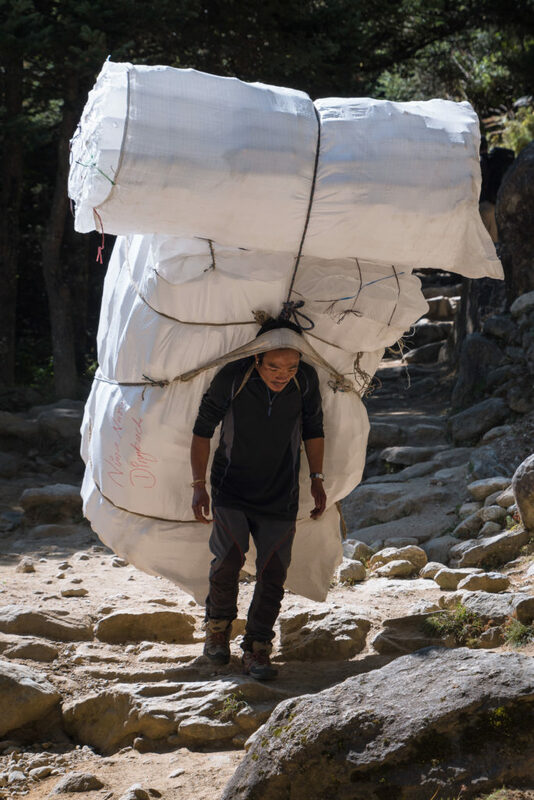 Three members of our team would turn around after Dingboche but they still had one climb to do the next morning. They left with Asmit at 3am for the 700m / 2300ft climb to the 5100m high viewpoint above Dingboche. They wanted to reach it before sunrise to have good photo opportunities. Blissful, I lay snug in my sleeping bag as Des got up in the dark to get dressed. 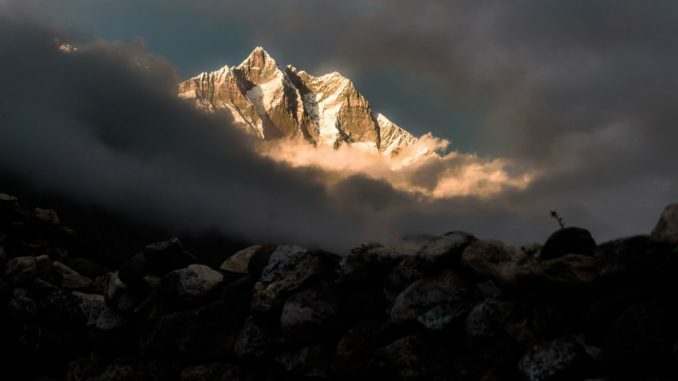 My early morning climb would only come later at Kala Patthar (5550m). We couldn’t do this one as we had to acclimatize for the remaining climb to Everest base camp. I may as well have gotten up then as my early morning breathlessness resumed. I also had a headache. At 14432ft I definitely felt the altitude. 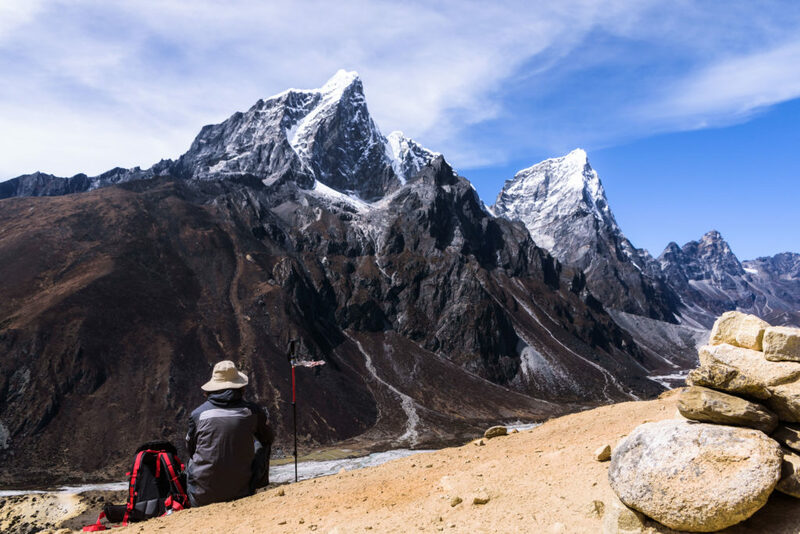 It was a good thing that we had a rest day planned in Dingboche. In the morning we would however climb an 800ft high “koppie” next to town for acclimatization, breaching 15000ft for the first time. On the way up we meet our three companions as they make their way back down from their summit climb. They are exhausted but also exhilarated after seeing a spectacular sunrise from the high viewpoint. The rest day is very welcome. After our early morning hike, I spend the whole day relaxing in the tea house. 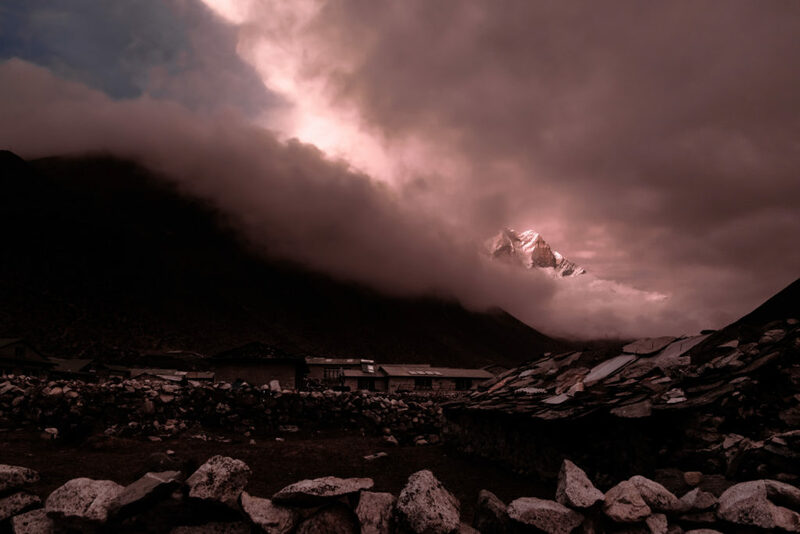 In the afternoon we find a small coffee shop close to our lodge and are then treated to a surreal sunset with dusky-sunset-pink clouds swirling around an orange glowing Lhotse face. 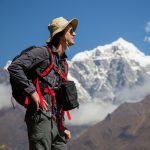 The next day we would set off for Lobuche in the Khumbu glacier. We we’re quickly making our way towards 5000m ASL. 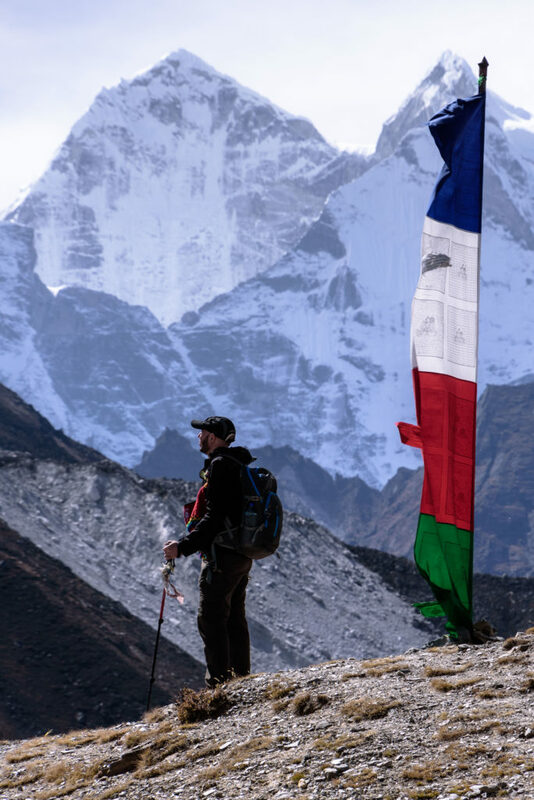 Click here for Part 1 of Eksteen’s Himalayan journey, and on the link below for Part 3.